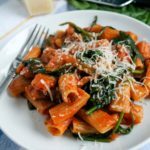 Oh, the dreaded weeknight dinner dilemma. 6:00 pm: I’m at work, I realize it’s getting late and I should probably finish emails and start walking home – 30 minute walk. 6:45 pm: I actually leave work. I am starving. Brian is nearly or already home and also starving. 8:15 – 8:45 pm: we actually eat dinner. Urgh. Don’t get me wrong, Brian makes dinner sometimes. He’s a connoisseur of pasta and toasted PB&Js (by the way, if you’ve never had a PB&J made with toast instead of regular bread, please go try it immediately), and has recently branched out on such culinary adventures as tacos and paninis. He can also make a mean salad if given the appropriate ingredients. But of the two of us, I’m the one most obsessed with the kitchen, and so approximately 80% of the time I’ll be the one making something. Which brings me to my point: spending an hour or more on dinner is just not practical for me during the week. 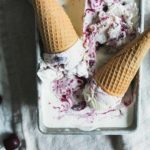 There are so many things I’d rather be doing when I get home, including but not limited to: having a glass of wine, watching the latest episode of House of Cards (so excited) or Veep/Silicon Valley/Game of Thrones (again, so excited), reading the news? scrolling Instagram, making brownies, anything that involves my couch. I really do love cooking, but on weekdays, I want something that basically cooks itself so I can live my life. Enter this one pan chicken dinner – it’s a winner alright. There is ZERO active cooking time on our part, and 100% of work done by the oven. Yes, this is something I can do on a Monday. Here are the steps: cut potatoes, toss with oil, salt, pepper, and thyme. Put in pan. Add lemons and thyme sprigs. 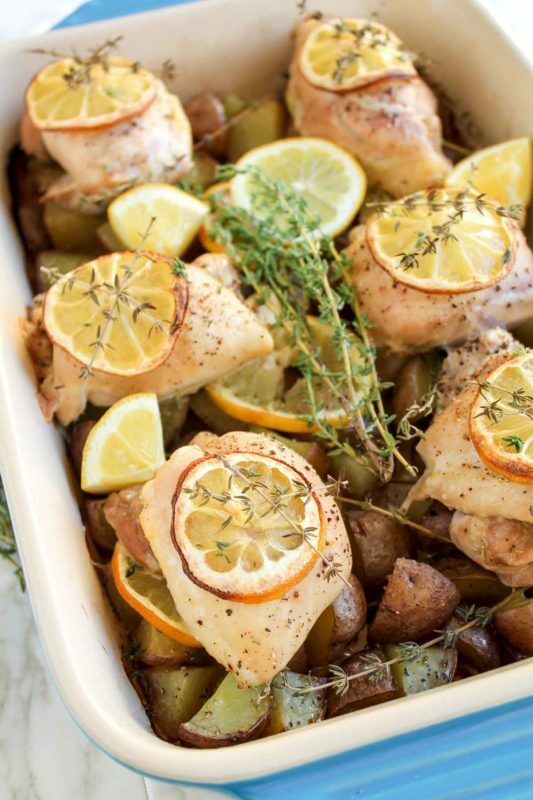 Put chicken thighs on top of lemons. 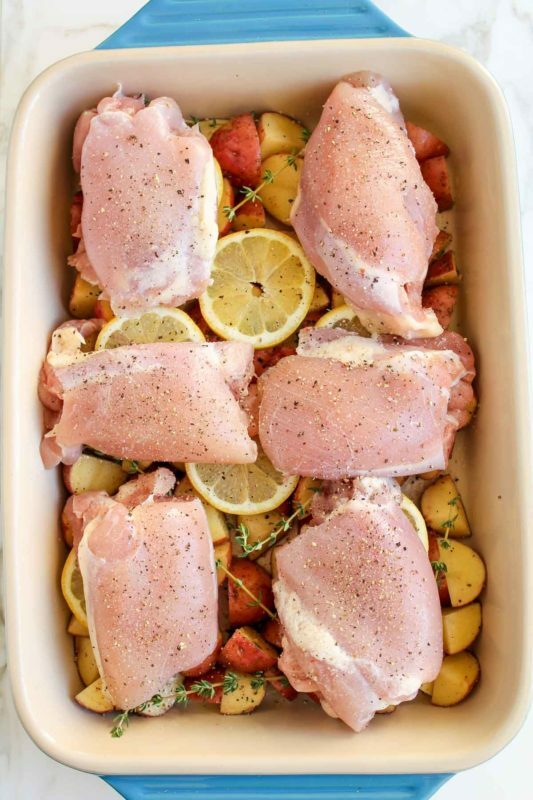 I prefer thighs because they are less likely to be dried out when cooked, but use breasts if you’d prefer! 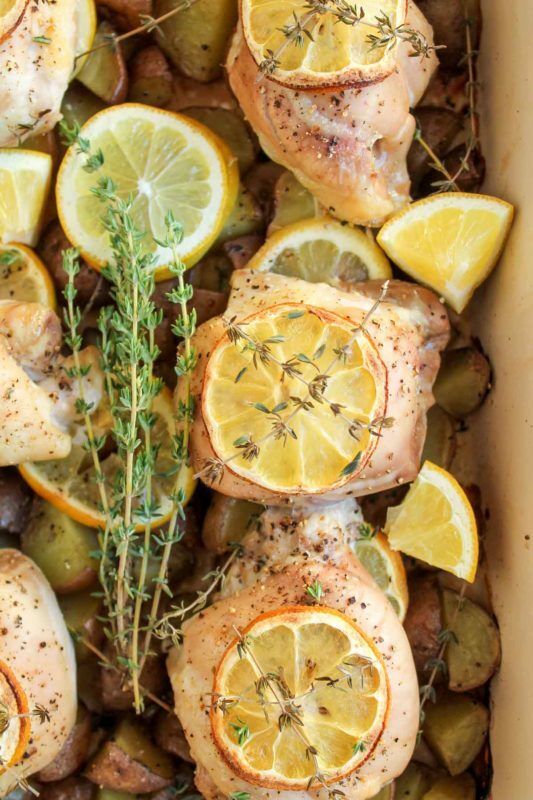 Sprinkle salt and pepper over chicken, add more lemon slices and thyme on top. Put in oven. Pour a glass of wine. DONE! Couch time. Approximately 40 min later, aka exactly the right amount of time to watch an episode of Veep, a thing of beauty emerges from the oven: your dinner. The smell alone is amazing and worth the 40 minute wait. I personally love that as the chicken cooks, the juices soak into the potatoes, so they taste extra delicious too. 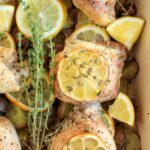 The flavor of the lemon gets a bit sweeter with the roasting and less acidic, and it really permeates the chicken with flavor. 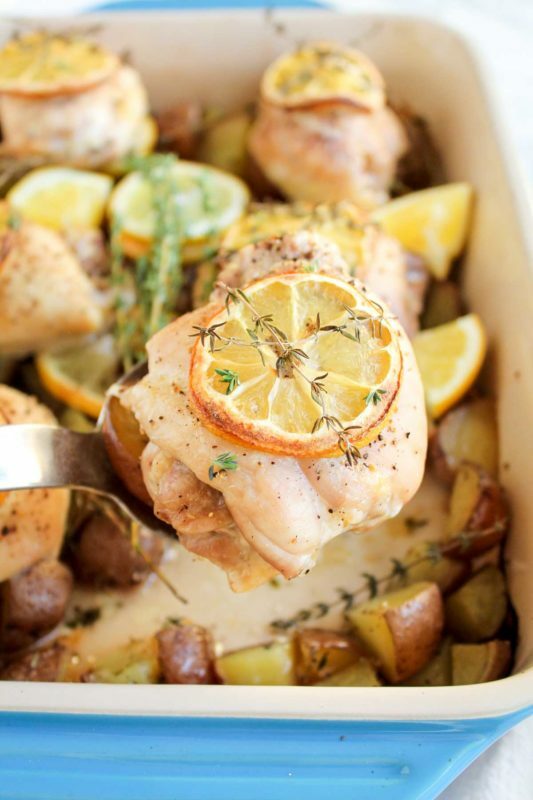 This is one pan chicken + potato perfection. 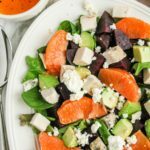 Add a salad or some greens if you like; you could also roast some brussels sprouts in there too and it would be lovely. Serve it up and pat yourself on the back because tonight (and tomorrow if there’s only a couple of you), dinner’s in the bag. I’ll take all the weekday wins I can get! 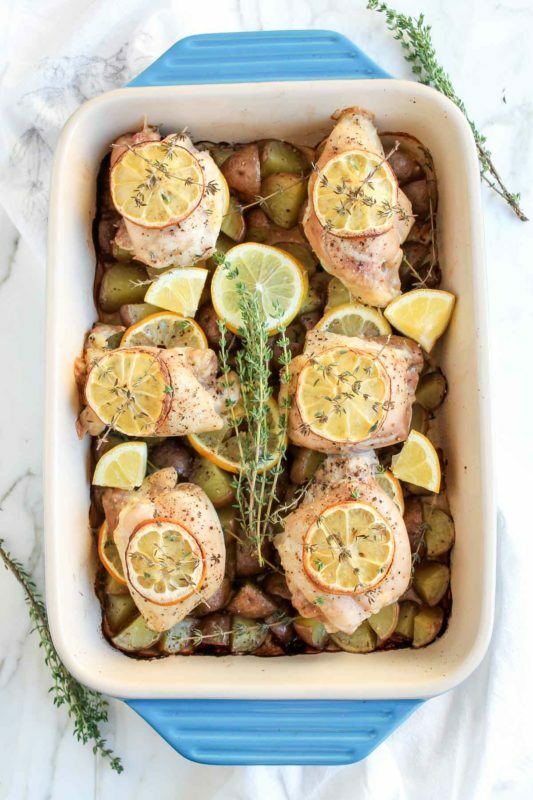 This one pan chicken dinner makes your oven do all the work - chicken thighs, lemon, thyme and potatoes all roasted together in one pan! 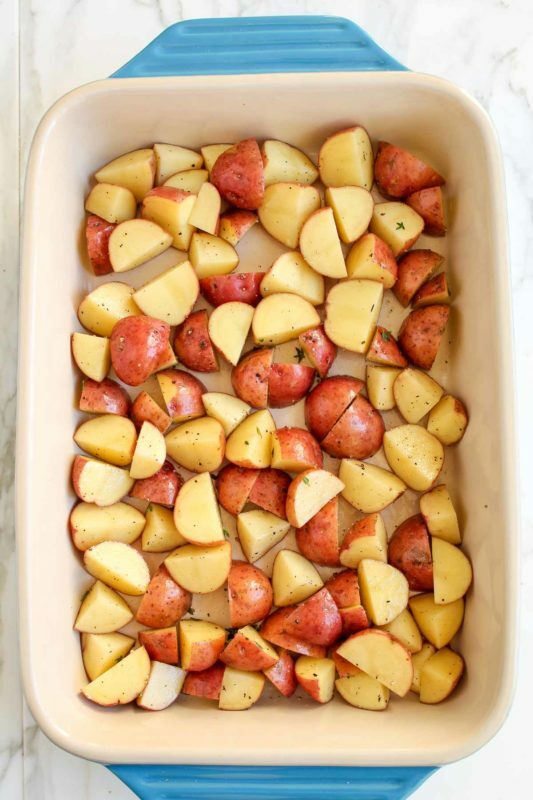 Quarter the potatoes and place them in a 9x13 or other large casserole pan. 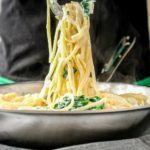 Drizzle with about a tablespoon of oil, then sprinkle salt and pepper and some thyme leaves to taste, and toss it all together with your hands so potatoes are fully coated. 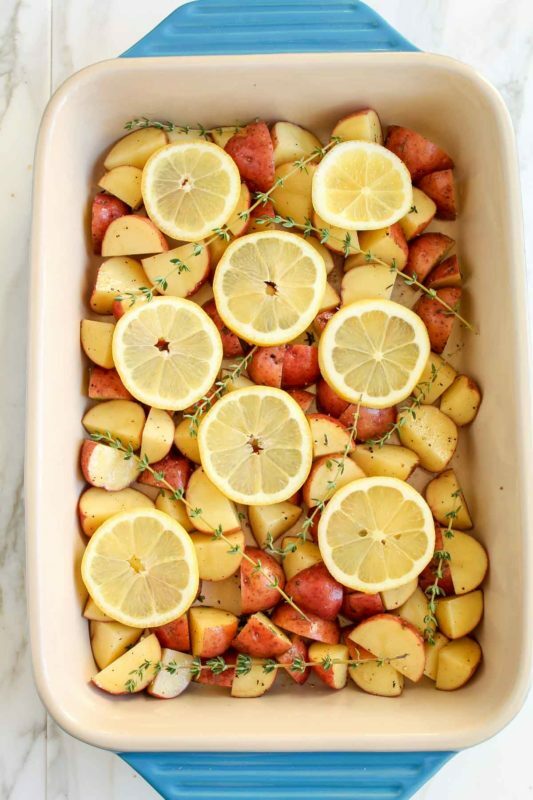 Spread out potatoes in an even layer in the dish. 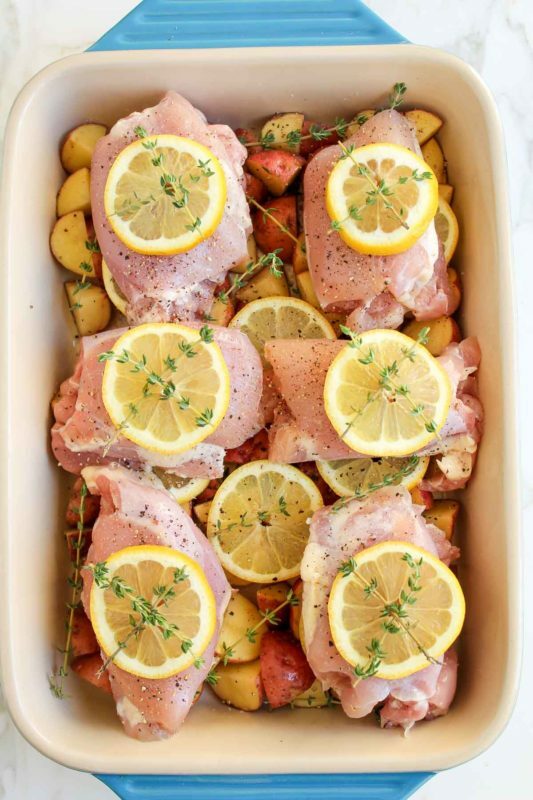 Bake for 35-40 minutes, or until chicken is fully cooked and an instant read thermometer says 165 degrees when inserted into the thickest part of the chicken thigh. Pat yourself on the back and serve!